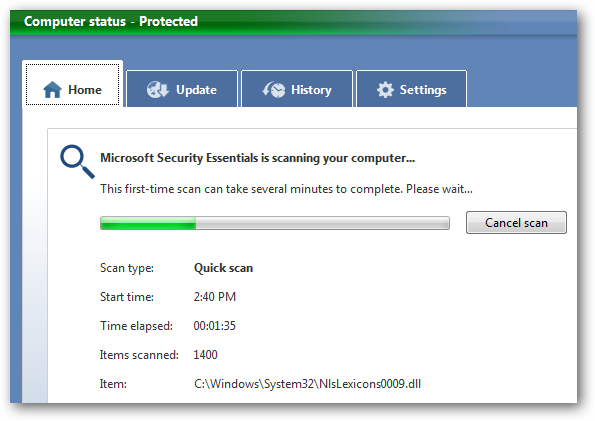 Microsoft Security Essentials is a free utility that provides real-time protection to identify and eliminate harmful viruses and other malware from your PC. Today we’ll take a look at how it performs and the protection it has to offer. 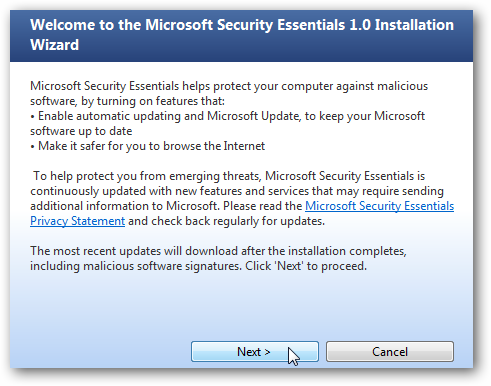 Microsoft Security Essentials (MSE) is free Anti-Malware protection that replaces their previous “pay for” utility One Care. It has left beta and version 1.0 was released to the public yesterday. As with the beta we showed you before, this version provides real-time protection and runs quietly in the background. It actually runs a lot like the beta version and the user interface is the basically same. Before installation make sure there is no other Antivirus or spyware application running on the machine. 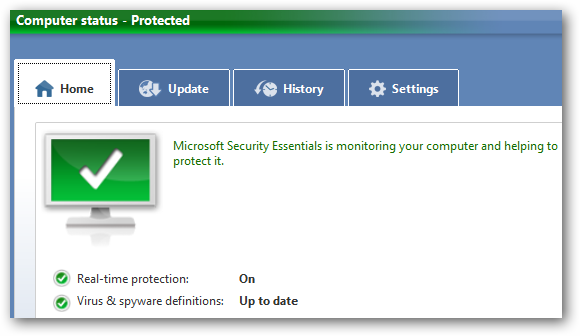 However, you don’t need to turn off Windows Defender, because MSE takes care of it for you. 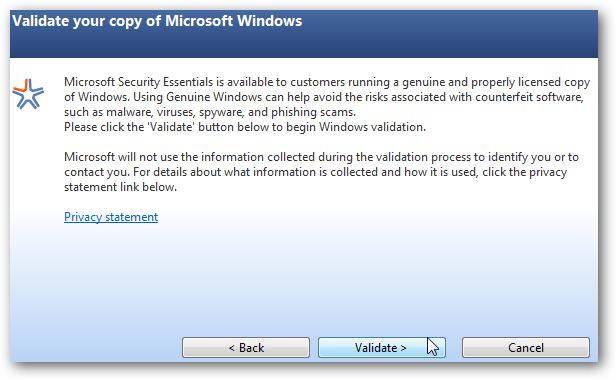 You will have to validate your copy of Windows to be able to install and use Security Essentials. The user interface is basic, simple, and easy to use. 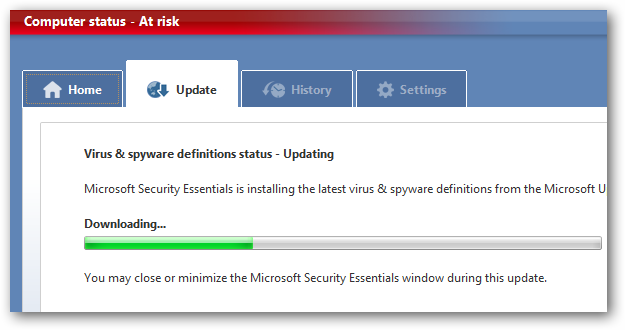 After installation it will update the virus definitions right away. After that it will update itself automatically in the background so once installed it truly is a “set it and forget it” process. After the database is updated the computer status turns green. There are 4 tabs at the top that allow you to control different functions. 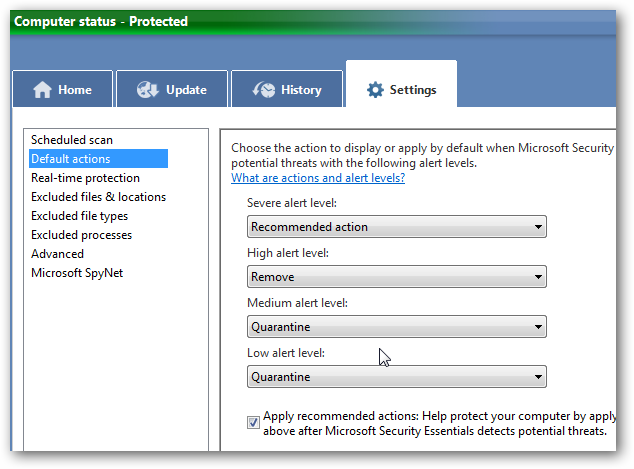 Under Settings you can choose what actions it should take with malware based on its threat level. 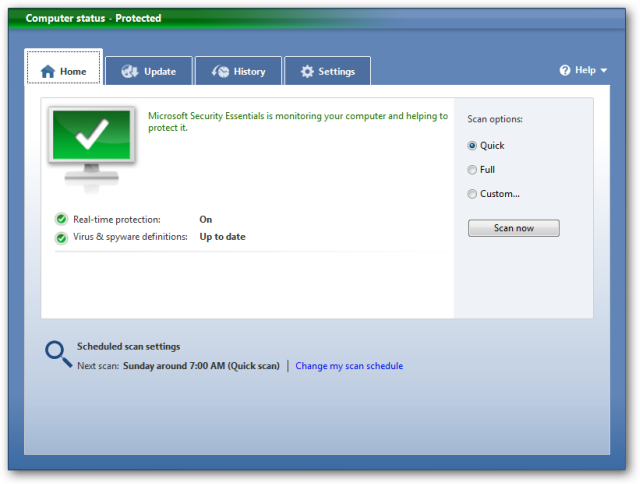 By default Real-time protection is enabled but if you want to disable it you want. The Real-time protection is light on system resources and doesn’t slow down other processes at all. It shows a green icon in the notification area letting you know your system is protected. Progress is displayed while a manual scan takes place and tells you the amount of time it takes. Scan times will vary between systems based on amount of files and hardware performance. 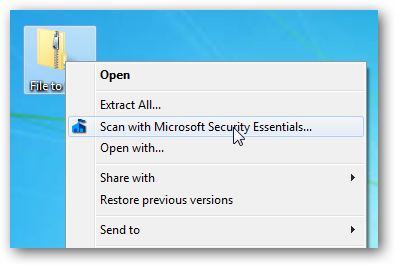 It works like most other Antivirus apps and lets you scan a single file. If a threat is detected a red attention screen pops up in the Notification Area and you can clean the threat right away based on your recommended actions or find out more detail about the threat. If you want more details, they actually provide a good amount of information on a threat. When in the details screen you can change the recommend action if you want and clean it from there. During out tests we tried to download an infected file, but MSE stopped it and wouldn’t allow the download to continue unless manually selecting to ignore it. This is very nice so someone doesn’t ignore the warnings, click out of the screens, and try to download and install the app anyway. For testing we ran this on the 32-bit version of Windows 7 Home Premium but it will also work with XP and Vista. It is light on system resources and runs quietly without constantly popping up messages and annoying you. It does pop up a message when it matters though. 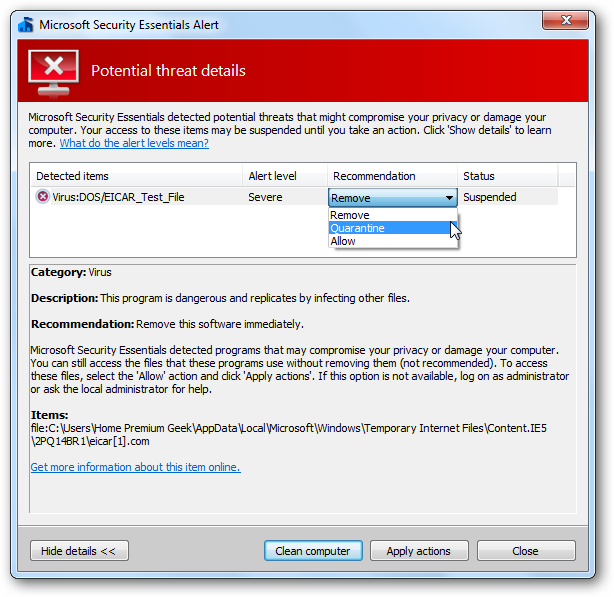 If a threat is found it will pop up a red alert to let you know about the malware and decide what actions to take. 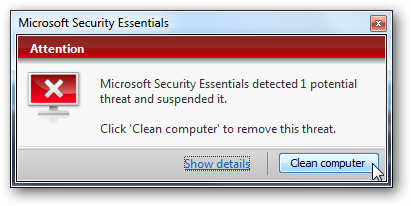 It’s nice to have a free anti-malware utility that is easy to use and effective. 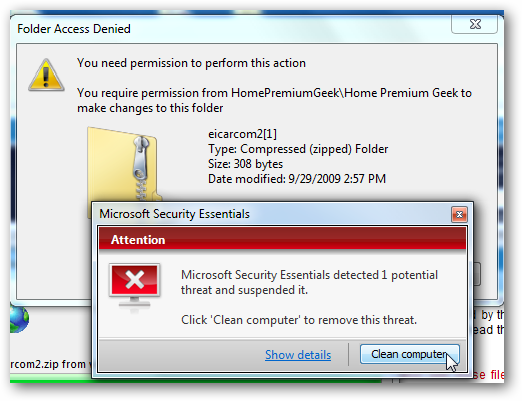 While Microsoft doesn’t always offer the best security solutions, they seem to have gotten this one right.